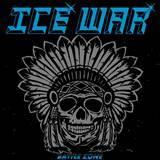 One of my surprise bands from a couple of years ago, Canadian heavy metal / speed punk Iron Dogs, changed their name to Ice War. Big frigging deal. It is still Jo Capitalicide’s band, and the musical direction still has not changed, right? But why then Battle Zone single has been such a disappointment in my ears? What happened? Why did the dog lose its snarly bark from Free and Wild turning all of a sudden into a tinny pooch yelp for the pair of tracks presented here? For one I just don’t get how Jo Capitalicide can like the sound presented on Battle Zone. No matter how much I turn up the volume there is not a trace of a bassline or a bottom end whatsoever. Is this my audio system, or is this by design? The NWOBHM galloping riff of the title track is quality, and solo/melody is OK too, but there is no bite, cold blade slice or trademark debauchery here. This Was Our Home is trying to make more noise with its riff, sends its solo on a little bit of an off-key angle, but the whole effort is still more sloppy than burly. Jo Capitalicide efforts to actually sing are commendable, but him being all over the place on Free and Wild actually had its charm. Battle Zone should still be attractive to the Toxic Holocaust fans, but is now a lot more about low energy punk than heavy metal, so Accept fans I invited to sample Free and Wild will do a lot better sticking with the Ambush latest record.